Ole Henriksen EMPOWER Collection Review - The Co.
Fight the first signs of aging, including dullness, dehydration, fatigue, uneven skin tone and loss of radiance with the new Ole Henriksen EMPOWER Collection. It features potent actives delivered from the Arctic to help protect the skin from free radicals and fortify the skin’s barrier defenses with arctic cloudberry, Nordic cotton extract and willow bark. The lineup features 3 new products, cleanser, moisturizer and hand cream that all use the same unique combination of beneficial ingredients to help tackle skincare issues associated with aging skin. Since this line is designed for those with normal to aging skin, I thought the Ole Henriksen Empower Foaming Milk Cleanser was going to be a little too drying for my dehydrated skin, but surprisingly, it wasn’t that bad. I usually stay away from anything foaming, however, this didn’t leave my skin tight or dry. Although this isn’t my ideal cleanser, for dry skin, it does an amazing job at removing all traces of long-wearing foundation and even waterproof mascara. It retails for $26. Ole Henriksen Featherweight Moisturizer is a completely weightless moisturizer that’s perfect for daytime use and under your makeup. It instantly quenches the skin and boosts youthfulness for a radiant glow to reduce fatigue and dullness. 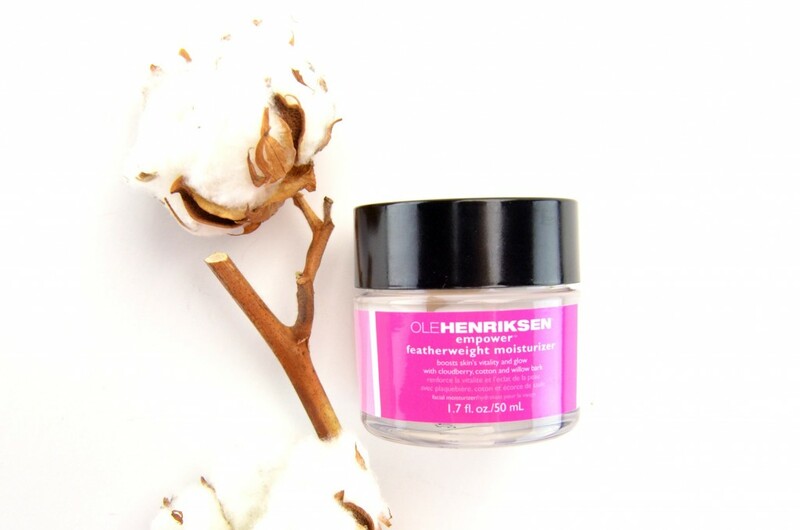 Ole Henriksen Featherweight Moisturizer has an incredibly light, almost gel-like texture that melts and absorbs into the skin fairly quickly. It gives almost a slightly cooling sensation upon first application, while helping to calm, soothe and reduce redness. Again, although it’s not created for those with dry skin, it’s the perfect morning moisturizer for me. It doesn’t feel too thick or heavy and applies seamlessly under my full-coverage foundation. It keeps my skin hydrated throughout the day, but I do need to follow up with a thicker, creamier, more hydrating moisturizer in the evening to keep the dry patches and flakiness at bay. It applies evenly and smoothly, absorbs within seconds and seems to give a healthy and radiant glow overtime. It retails for $36. Ole Henriksen Empower Hydrating Hand Cream has an extremely hydrating formula that melts into skin, penetrating deep into the dermal, creating a lather to help condition the skin for all day moisture. It provides long-lasting comfort without a greasy, sticky or waxy feel and is the perfect hand cream to keep in your purse. It retails for $20. This is an excerpt from the article Ole Henriksen EMPOWER Collection Review which originally appeared on http://www.canadianfashionista.net/.